Mercy Air, a division of Air Methods, announced the opening of Mercy Air 66, a new base that will provide air medical services to the Barstow community. The new base will be located at the former site of the Barstow Community Hospital at 555 S 7th Street, and will result in quicker response times for emergent and trauma situations. Mercy Air 66, along with all air medical services, provides essential and lifesaving services throughout the country. During missions, highly trained medical teams care for patients with lifesaving interventions, from providing trauma care after an accident to administering clot-busting medications that must be given shortly after a major stroke to significantly improve outcomes. With the continued consolidation of hospitals and the trend towards centers with specialized heart or neurological care, the clinical support and speed of missions is critical to giving patients the best possible outcomes. Local community and hospital leaders recognized the growing need for an air medical service that would be able to serve the Barstow area more rapidly and worked with the Mercy Air team on a new base. "Having Mercy Air located at the former hospital across the street from the current hospital facility will be an asset to emergency care for our community members. There are times when we need to stabilize a patient at Barstow Community Hospital and transfer them to a higher level of care. In these life-saving situations, minutes count. Having Mercy Air's emergency air ambulance basically on site could mean the difference between life and death," said Leo Eusebio, Emergency Department Director at Barstow Community Hospital. "We strive to serve the community with the highest level of patient care possible," stated Barstow Fire Chief Jamie Williams. "I believe this community-based helicopter program is a critical service that will provide our citizens with the best opportunity to reach a trauma center within the critical golden hour to help reduce response times during life threatening emergencies." Mercy Air 66 will provide air medical services 24/7/365 to Barstow and surrounding communities. 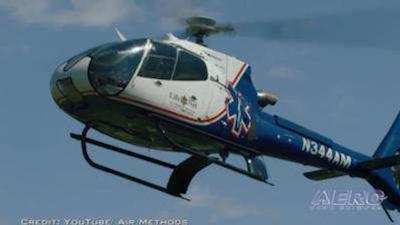 The Mercy Air base will be staffed by 14 crew members, including pilots, flight nurses, flight paramedics and mechanics, and it will operate a Bell 407. Its location immediately across from the current Barstow Hospital will ensure patients have quick access to the full medical services available after initial transport. "We understand that ongoing changes in healthcare are affecting access for patients. From accidents to interfacility missions, our goal is to make sure life-saving care is available at a moment's notice," said Air Methods Area Manager Jason Johnston. "With this new base, we are supporting the Barstow community and providing patients and residents with the peace of mind that we are here when they need us the most."